We want Springest to become the largest source for learning in the world. From books and e-learning courses to on-site trainings, we help our users discover, compare, and book everything they need to reach their personal and professional learning goals. We have a strong product focus in which everything revolves around the users of our Dutch, German, Belgian, UK, and US sites. Next to that, more and more organisations are using our SaaS tools to stimulate and manage learning for their employees. We are looking for a senior Frontend Developer to join our growing engineering team. We don’t have managers at Springest, but processes, and we feel that individuals taking responsibility is very important. At Springest, you will work in close collaboration with product owners, marketing, and sales colleagues. You are also a member of our development team where we discuss architecture, infrastructure, and keep a close watch on security and performance. Our main application runs on Ruby on Rails backed by Postgres, Redis and Memcached. Next to that we rely on Elasticsearch to power our search which is a big part of our product. We also have some smaller Go and Elixir projects in production. We are hosted on AWS and make heavy use of their offerings like RDS, CloudWatch, Elastic Beanstalk and EC2 Container Service. For our frontend stack, we work with Slim, Sass & CoffeeScript. Some libraries we use are jQuery, Bourbon/Neat and Backbone (but mainly we care about using the right tool for the job!). In our product development flow we often use tools like Balsamiq and Sketch for designing features. 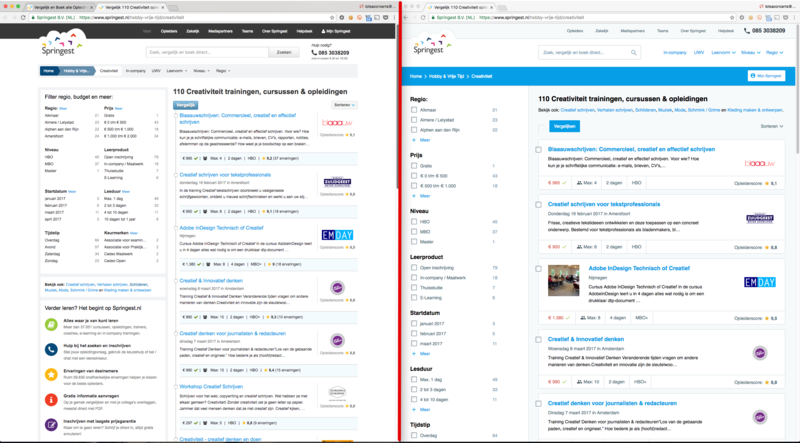 As a Frontend Developer, both your creative & technical input can help to refine the output. Next to our main application we build internal tools whenever necessary to help ourselves and our growing Learning Advisor team. It is extremely rewarding to see small development projects make a big impact for other Springeteers, which in turn can result in more of our visitors being helped of course! We also do a regular internal hackday where we drop everything and work on something completely different. We might give a new programming language a shot, try out an idea someone’s been toying with for a while or hack on some actual hardware. A lot of hackday ideas actually became super important for our business. 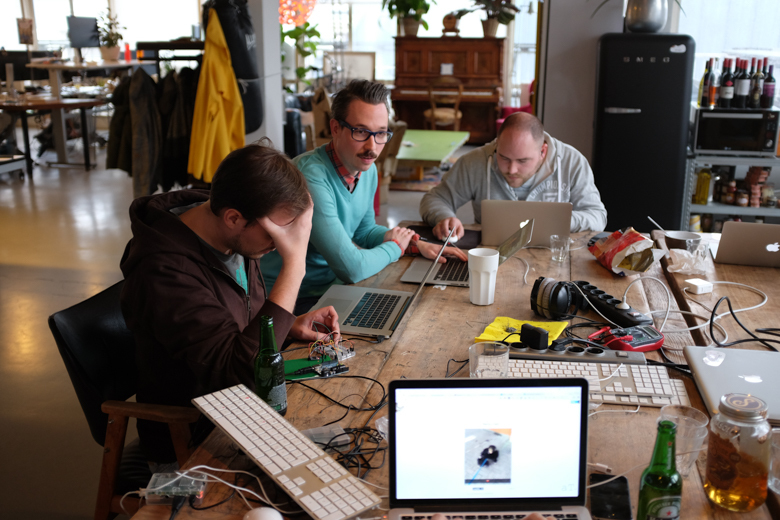 Check this recap of a recent hackday to read more about why we organise them. 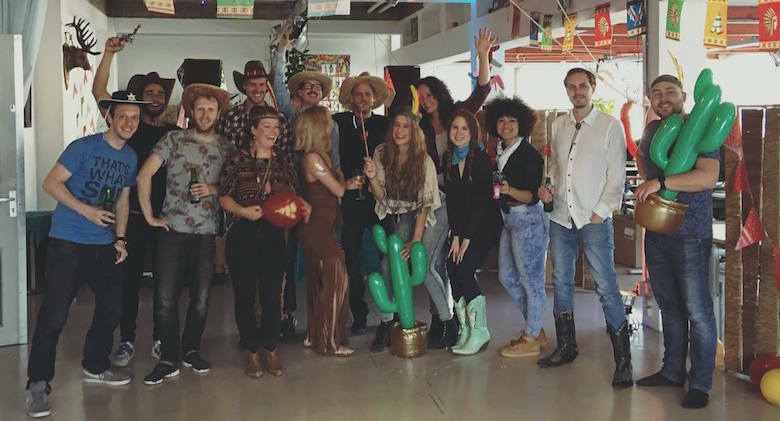 At Springest you will work with around 50 colleagues (that’s not all of us and no we’re not always in full cowboy gear, this was our Western themed SpringFest!) who all are very skilled at what they do and all of them have a healthy dose of nerd skills that we really value. Our Product Owners also regularly ship code! Springeteers are a happy bunch and we often get together outside work to enjoy free time as well. Our office is a cosy place where anything goes and where we all take good care of together. If you’re not good at ping-pong yet, you have a good chance of becoming good here as well! 🏓. We are all active organisers and members of Meetups and other forms of knowledge exchange (learning is our hobby!) and we participate quite actively in the Amsterdam startup ecosystem. In addition to that we get a lot of attention for Springest being the poster boy of how Holacracy and GTD can work for an organisation, which in turn is due to our organisational structure without managers and other unnecessary overhead. helping to craft the user experience for our big but inspiring challenge: building the ultimate product for 21st century Learning. We’re currently one of the best-known platforms where people book their classroom and e-learning courses. But in our quickly-evolving society, people continuously supplement their learning profile with personal & social learning experiences. Because you learn every day: from articles, books, meetings & inspiring conversations. For this, we need the best possible backend + frontend + AI force we can gather. We’re well on our way, but we can’t wait to strengthen our team with extra frontend power. We are very remote friendly. At least a € 1,000 education budget per year to spend on training, courses, and conferences. Stock options after 2 years. A cool workplace in the center of Amsterdam with height adjustable desks that you can sit and stand at, table tennis, a massage chair, and balcony with a barbecue. All software and hardware you need to do your job and have an optimal workflow. Contact Rik Matena (rik@springest.com) for questions and applications. Please include links to your Github and LinkedIn profiles. We want Springest to become the largest source for learning in the world. From books and e-learning courses to onsite trainings, we help our users discover, compare, and book everything they need to reach their personal and professional learning goals. We are looking for senior Ruby developers to join our growing engineering team. We don’t have managers at Springest, but processes, and we feel that individuals taking responsibility is very important. At Springest, you will work in close collaboration with product owners, marketing, and sales colleagues. You are also a member of our development team where we discuss architecture, infrastructure, and keep a close watch on security and performance. We do a regular internal hackday every month where we drop everything and work on something completely different, which we feel is super valuable for coming up with new ideas. We might give a new programming language a shot, try out an idea someone’s been toying with for a while or hack on some actual hardware (that’s our temperature sensor above in its beginning stages!). A lot of hackday ideas actually became super important for our company, its a great chance to experiment with something that could grow out to become a key factor of our business. Check this recap of a recent hackday to read more about why we organise them. You have a broad interest and deep knowledge, certainly not just in/about Ruby. We are all about learning and sharing knowledge. Contact Mark Mulder (mark@springest.com) for questions and applications. Please include links to your Github and LinkedIn profiles. At Springest we pride ourselves on our company culture and Frissr made a nice video of it. A big part of the video is about what it’s like to work as a developer at Springest. Interested in working at Springest? Check out our vacancy for a senior ruby on rails developer.